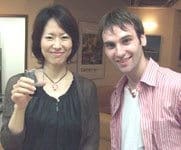 ​On the 22nd of August 2009, Smith's School of English Kyobashi Corner enjoyed a Cheese and Wine party. We decorated the lounge and classrooms with posters advertising our party. We also advertised verbally asking the students what styles of Cheeses and Wines interested them the most. ​We had made a list of red and white wines, from Spain, Italy, Chile, Australia and France and our list of Cheeses from France, England, Italy and Germany ready. So we went off to purchase our inventory from Costco in Amagasaki. Costco is a Wholesale Warehouse selling superb food and drinks from around the world. With our inventory in mind, we managed to get everything that we needed and saved a few pennies as well. ​Eve of the party everything was laid out and the wine was chilled for the most of the day. Our Head Office ladies helped by preparing impressive dish's, consisting of Cheese and Smoked Ham. The front desk in the lounge became our serving space and along the front we had our chopping boards decorated with cheeses and snacks. ​Just before 7pm our students started to come and as soon as they walked through the door, they where greeted with a kindly smile and glass of wine. As soon as the wine was poured we asked them to join in on our game “Guess How Many?” We asked each to guess how many chocolates we had sealed in a jar. Simple but fun.About an hour into the party the lounge was buzzing with conversation, the topics of interest for everyone were having fun eating, drinking and laughing. After all we are an English School, why would not there be fun, and especially in English! ​Now it was time for the game of the day “Tongue Twister”, we played this game with a Japanese example (Namamugi Namagome Namatamago), but before we allowed anyone to consider trying the English edition we surprised them with a Free Lesson as the prize. We used the classic ‘She Sells Sea Shells by the Sea Shore’ as out Tongue Twister. After a few tries, comic tries, we had a winner. Congratulations! ​The party was winding down, and for the last half-hour we gave the results of our game “Guess How Many?” The students where way off with their counts, but in the mix we had a winner. Very successful count, spot on with her guess, congratulations! She was even thoughtful enough to share them around.We thanked everyone for coming and a final group photo was taken. We said our goodbyes and see you next times at the door. Smith's School of English would like to wish thanks to our students for attending our Cheese and Wine Party.